About 1 and 1/2 cups liquid and half of a large or one whole avocado is a great foundation for a smoothie. From there, toss in the ingredients you have on hand or whatever sounds good and you’re golden. For this smoothie I grabbed the frozen cherries out of my freezer and blended up a real treat. Tasty and healthy. Avocados are considered a superfood by some, and for good reason. They are rich in dietary fiber, healthy fats, carotenoids, folate, potassium, B vitamins, and vitamins C, E, and K.
These nutrients contribute to a healthy heart, reduction of inflammation, protection against liver damage, anti-cancer benefits, healthy eyes, blood sugar regulation, and healthy cholesterol levels. The fats in avocados also help your body absorb and assimilate fat soluble nutrients from other foods when eaten in conjunction. Another reason I love adding avocado to smoothies and salads. I provided plenty of add-ons for you take this smoothie in the direction of your choosing, or just make as is, delicious and healthy either way. Enjoy! Please leave a comment below if you try this delicious avocado cherry smoothie. Happy Blending! LOVED THIS SMOOTHIE!! I added everything but the blueberries & it was awesome! You included all the add-ons except the blueberries, excellent work! Glad you liked it. Excellent! I made this today, adding cocoa and spinach, and omitting the sweetener. Very delicious and filling. I used unsweetened soy milk, as that is what I had on hand. Ryan, what is your take on soy milk and other soy products? Oops! I later ran into some links you posted about non-fermented soy being unhealthy. I agree, but it’s a tough one for me to get away from completely! You’re quite the smoothie master, Niko. Great to hear you enjoyed this recipe too! As you uncovered, I’m not a fan of soy products. Almond and hemp milk, or my favorite raw milk are good soy milk alternatives. Okidoke. I think I’ll try just adding more nuts and seeds into my smoothies to make them “milky” I like almond and hemp milk too, but using the whole nuts/seeds will help keep things simple for me. :D Thank you! Are sour dried cherries acceptable? I see there is some sugar added. Sour dried cherries are perfectly acceptable, especially if you can find them without added sugar. 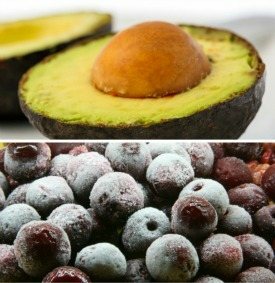 Although, they won’t blend quite the same as frozen cherries – the consistency of your smoothie will be different. I am also addicted to avocados since my daughter started to write “The Avocado Affair”, I add the health benefits as a medical doctor. With the different forms of IBS, I discovered that we can use avocado as a substitute. I just did avocado, fresh spinach, cherries, raw honey and water, it is delicious, nutritious and lower in calories. A book dedicated to avocados by your daughter – excellent, Claude! Avocado smoothies are by and away my favorite. I just got home from buying some ingredients to make this avocado cherry smoothie and four more of your other smoothies like the creamy avocado smoothie( that I made and drank up in 2017) I have the ingredients to make the snookerdoodle smoothe,the vanilla thrilla smoothie and the coconut macadamia smoothie that I also made in 2017. I will let you know how much I enjoy drinking the avocado cherry smoothie on Wednesday afternoon. I just looked at the nutrictional information and I can’t make this avocado cherry smoothie because it is too high in carbs and sugar.i have type 2 diabetes and this smoothie will raise my blood sugar a lot. Try using only 1/2 cup pitted cherries and a non sugary milk. The raw milk I used is what pushed up the sugar.